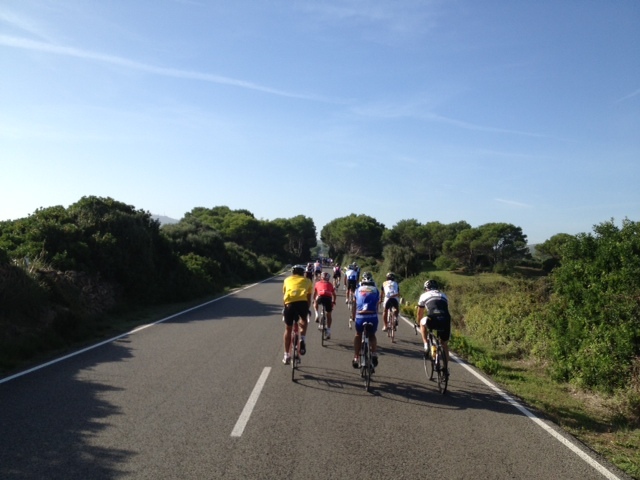 It’s a three day sportive on the Balearic island of Menorca. It takes place in the middle of October each year. It has a rolling road closure, good feed stops, great weather and a very friendly atmosphere. The bunch rides round together at a steady 18mph average which may not seem like much but the roads are quite lumpy and after all it is October. It’s a great way to wind down the cycling season as it’s very relaxed, relatively short. And in the six years I’ve taken part it has only rained once. Above pic: Palm trees and sunshine in October, must be Menorca! 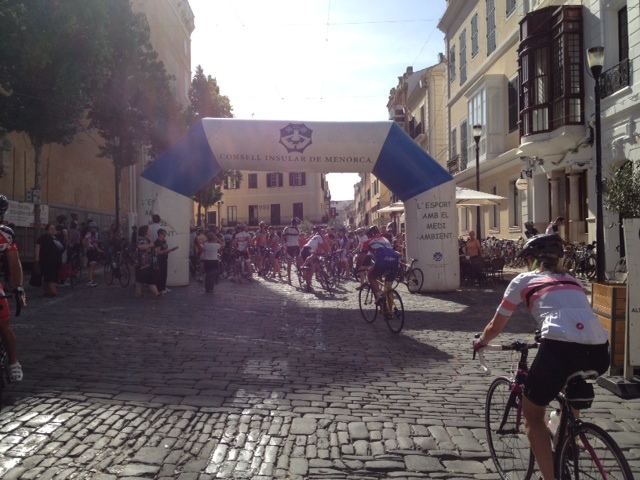 The event is based at the island’s capital Mahon and follows a similar format each year. Friday afternoon is a gentle 30km potter out to a local place of interest for nibbles followed by a welcome presentation in the evening. Saturday is a 100km ride with a 2km timed climb on a closed road and Sunday is a short 60km ride over to a timed ascent of Monte Toro and back before one of the best rider presentations and dinners around. The event is growing in popularity with UK riders with 64 attending this year (out of a field of 250). Many riders come back year after year for the Volta with most promising to return again next year with more friends. It’s not just the cycling that attracts people back year after year, the sunshine, friendly locals and many inexpensive places to eat and stay (it is out of season for them remember) make it an ideal long weekend away. This year’s short excursion was over to the coast at S’Algar. It’s a very easy ride and an opportunity to give the bikes a test after the flight over. It’s also an introduction to the varied roads on the island as it’s a mix of small, tight twisty lanes and wider roads. The coast is beautiful and the drinks and nibbles are consumed in 27℃ heat so no one’s complaining. Then it’s back to Mahon to freshen up before the event welcome presentation. 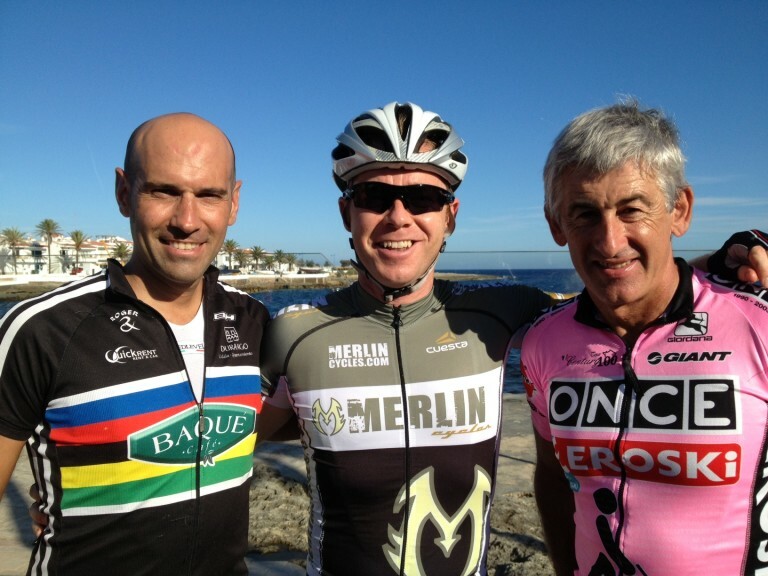 There are always former or current Spanish professional cyclists taking part and this year’s stars were 2003 world race champion Igor Astarloa (left in pic) and Tour of Spain winner and Spanish legend Marino Lejarreta (right in pic). Afterwards it’s more Menorcan products to taste and the wine and gin helps to break the ice. 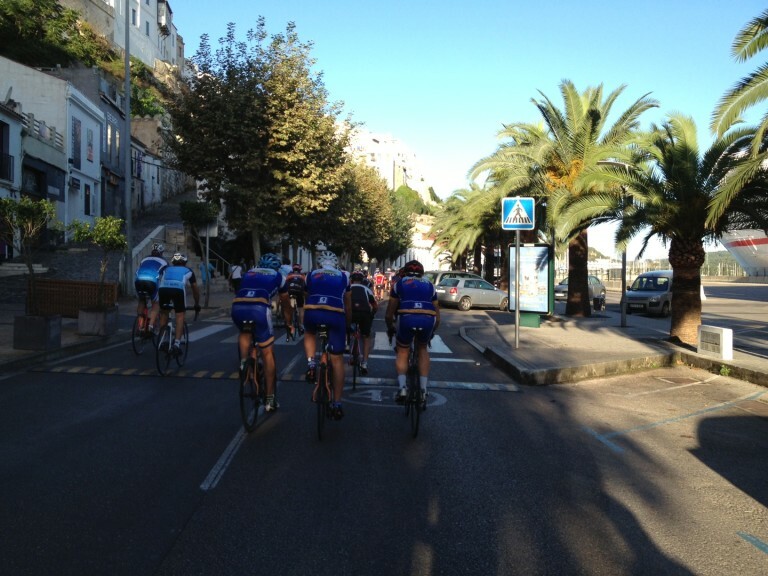 Saturday is the biggest day with a 104km loop into themiddle of the island and back via the southern coast. Just before lunch is the first of two timed climbs over the weekend on the short sharp S’Enclusa. It’s only 2km but about 10% so offers the chance for the fitter riders to test themselves. Photo right: S’Enclusa the 2km timed climb on Saturday. The run back to Mahon is lumpy but the coastal views are stunning and it’s not long before we’re sitting in the square for a quick drink to enjoy the 29℃ temperatures. Saturday afternoon is free so many take in the sights and what better way than a trip round the harbour in a boat to relax. Sunday is the toughest day and although it’s only 65km it has the biggest climb of the event; Monte Toro. Sunday dawns fresh and there are many who may have relaxed too much the previous afternoon and evening but thankfully the pace is nice and sedate. Above pic: Empty roads as well as legs. Once at Es Mercedal and the foot of the climb though it’s a free for all. The climb of Monte Toro is just over 3km long and rises 350 metres to the highest point on the island. This really tests everyone and as the road is closed the fast guys are stomping up it while the rest of us enjoy the views out across the island. Thankfully there’s a drinks stop at the top before another lumpy run in to Mahon. Overall it’s about 200km riding all weekend but believe me you’ll feel it in your legs after. Above pic: Finish on Sunday, glad it was only 65km today. The rider party on Sunday afternoon has a typical end of season feel about it with a very lively atmosphere. Prizes for the climbs and various age related categories are handed out to boisterous applause and cheering and to round it off this year the organiser Arturo Sintes took to the stage with his band to entertain the riders and guests. After an incredible lamb dish and plenty of free wine the afternoon finished with lots of dancing and even more smiling tired people, an excellent way to round off a superb weekend riding in the sun. 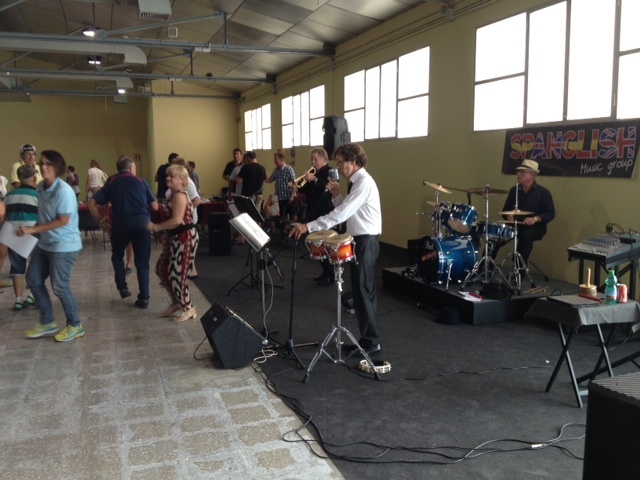 Above pic: How many sportives in the UK have a live band and people dancing after? 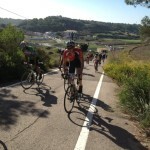 Tagged Events, menorca, spain, sportive, training, travel. Bookmark the permalink.